Copyright 1976. I paid $4.25 for my kit back then at a local shop that went out of business. The Panzer I was a light tank produced in Germany in the 1930s. The name is short for the German Panzerkampfwagen I ("armored fighting vehicle mark I"), abbreviated PzKpfw I. The tank's official German ordnance inventory designation was SdKfz 101 ("special purpose vehicle 101"). Experiences with the Panzer I during the Spanish Civil War helped shape the German Panzerwaffes' invasion of Poland in 1939 and France in 1940. By 1941, the Panzer I chassis design was used as the basis of tank destroyers and assault guns. There were attempts to upgrade the Panzer I throughout its service history, including by foreign nations, to extend the design's lifespan. It continued to serve in the Spanish Armed Forces until 1954. The Panzer I's performance in combat was limited by its thin armour and light armament of two machine guns. As a design intended for training, the Panzer I was not as capable as other light tanks of the era, such as the Soviet T-26. Although weak in combat, it formed a large part of Germany's tank forces and was used in all major campaigns between September 1939 and December 1941. The small, vulnerable light tank would be surpassed in importance by other German tanks, such as the Panzer IV, Panther, and Tiger; nevertheless, the Panzer I's contribution to the early victories of Nazi Germany during World War II was significant. Later in that war the turrets of the then obsolete PzKpfw Is and PzKpfw IIs were repurposed as gun turrets on specially built defensive bunkers, particularly on the Atlantic Wall. Between 1934 and the mid-1940s, several variants of the Panzer I were designed, especially during the later years of its combat history. Because they were obsolescent from their introduction, incapable of defeating foreign armor, and outclassed by newer German tanks, the Panzer I chassis were increasingly adapted as tank destroyers and other variants. One of the best-known variants was the kleiner Panzerbefehlswagen ("small armored command vehicle"), built on the Ausf. A and Ausf. B chassis—200 of these were manufactured. The Panzer I Ausf. B chassis was also used to build the German Army's first tracked tank destroyer, the Panzerjäger I. This vehicle was armed with a Czech 47-millimeter (1.85 in) anti-tank gun. Italeri is an old prolific model company based in Italy. They manufacture all manner of model subjects in the popular scales. The box art shows a Panzerbefehswagen moving across a field with some houses way in the background. One house looks damaged. The tank is overall Panzer-gray with a white cross on the front of the fighting compartment and a yellow wheel shaped unit insignia. 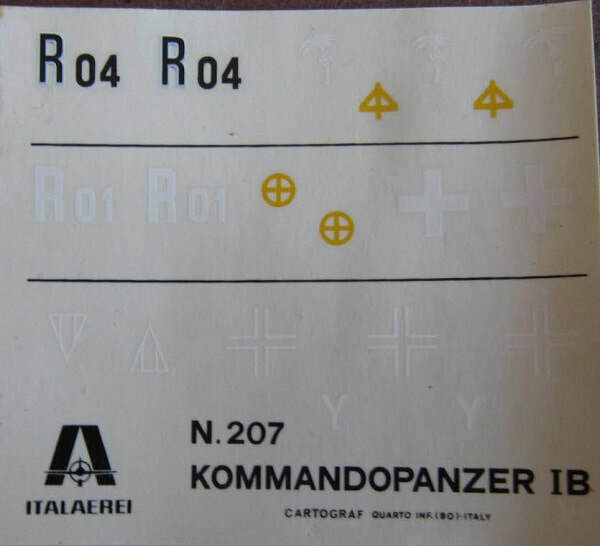 There is a large white letter "R" followed by a small white number 01 on the fighting compartment sides. This is a tank of the commander of the Panzer Regiment 6, 3rd Panzer Division, 9th Army Korps, 4th Army in Poland, September 1939. One side panel of the box has a one-paragraph history of the tank in Italian, French, English and German. 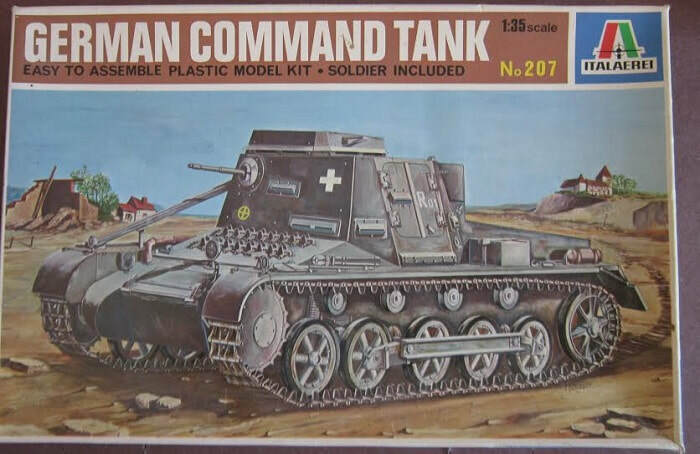 The other side panel has 3 color box arts of other AFV kits that Italeri manufactures: kit no. 217 - a Pz.Kpfw. IV Ausf. F1/F2 & G, kit no. 314 - a U.S. Willys Jeep and kit no,. 214 - and Italian Semovente M40/42. This kit holds 2 dark-gray trees in a sealed cello bag, the decal sheet and the instructions. The instructions consist of a single sheet that accordion-folds out into 6 pages in 7 1/2" x 10" page format. Page 1 begins with a black and white photo of the model made up with no markings on it, over the tank's history in Italian and English. Page 2 begins with ATTENTION, USEFUL ADVICE in 4 languages, over the parts trees illustrations. Part trees are not alphabetized. Instead they are labled with geometric symbols - a square, triangle and circle. Some parts are shown X'd out. Pages 3 and 4 give a grand total of 6 assembly steps. Page 5 has a 3-view of a Befelswagen in overall sand yellow. It has a large black "R" followed by a black number 04 on its sides and a yellow division mark for Panzer Regiment 8, 15th Panzer Division, Panzer Army Libya, Africa, September 1941 and a white Afrika Korps palm tree with swatika on its sides. The bottom of page 5 has painting instructions for the standing figure smoking a pipe. 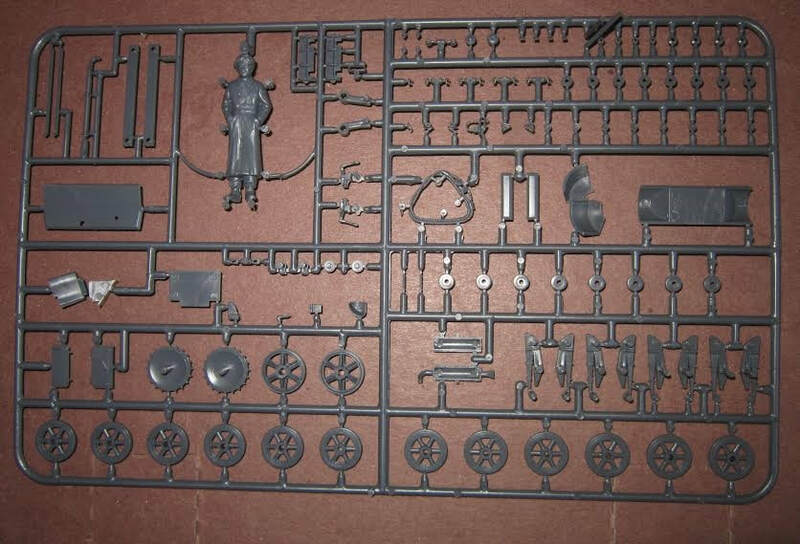 Page 6 has a 3-view of the box art scheme (already described above) and another 3-view of a befelswagen that is overall Panzer-gray with a white skeletal cross on its sides and rear and a yellow "Y" shaped unit mark on the front and rear. This tank was with the staff of the 7th Panzer Division, 4th Army Korps, Panzegruppe "Kleist", France 1940. ​The decal sheet completes the kit. 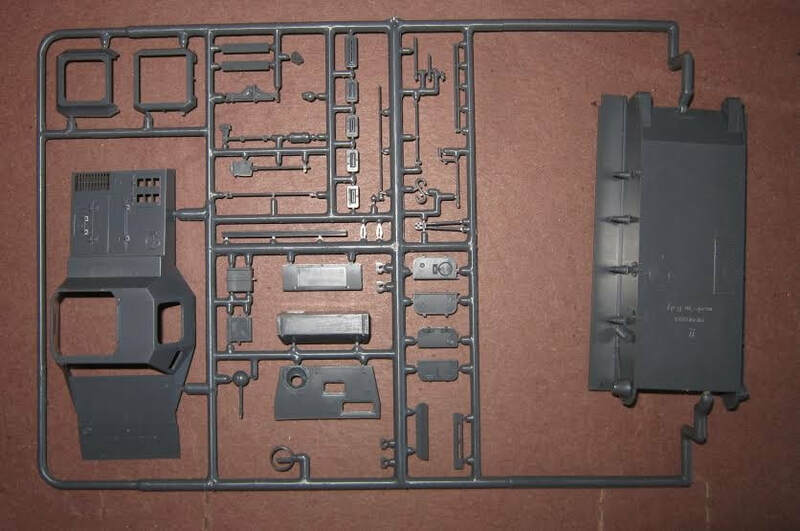 This kit is very nicely detailed externally, but there are no interior details. ​I bought my kit at a local hobby shop that went out of business.